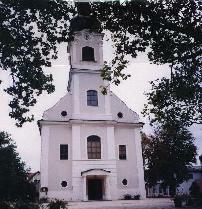 Church is located in the center of town. Road repair work was going on all the time we were there in front of and to the right of the Church. The monument in front of the Church had been moved temporarily and the road was being made closer to the Church. The monument was going to be set in a separate area in the middle of the road in front of the Church. 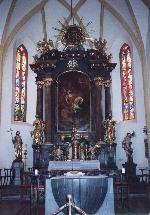 We attended Church services here, but since it was in German, we didn't understand what was said. But we felt that wasn't important as we were there to honor the Lord. 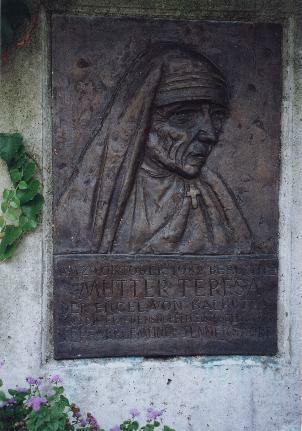 Mother Teresa plaque outside entrance to the Church. The date October 1982 was printed on it, so we assumed that perhaps she had visited the town of Jennersdorf on that date.